I’m excited at the acquisition of any children’s book, but would be lying if I didn’t say I get an extra kick of joy when a brown author sells one. Add another brick on the stat pile – 1 brown book acquired. Only eighty-three to go to beat the 2008 numbers of kiddie lit by African American authors (CCBC Choices). Note, I hope it ends up being a whole lot more than 83! 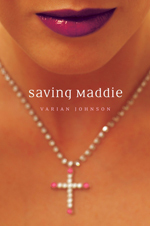 Meanwhile, don’t forget, Varian’s, Saving Maddie hits stores January 2010. So exciting! Varian rocks, and I can’t wait to read Saving Maddie! CONGRATULATIONS! I am so excited — the book’s not even out yet, and on faith, they’ve bought the sequel. WAY TO GO VARIAN! Hooray, Varian! So proud of you. Keep up the GREAT work!! !